1. California: Still makes up 50% of all residential solar installs in the country! And the signs look good for California to continue it’s roll as #1 solar state. 2. Southwest is heating up: With abundant sun, Nevada, Arizona, New Mexico and Colorado continue to lead the charge, despite some of the political fights that are going on there between solar and utilities. 3. The Northeast is a powerhouse: While it’s not as sunny, power prices on the east coast have been rising insanely fast and people are looking to save money. New York may have some of the best policies in place in the entire country, but Massachusetts, New Jersey, Maryland and Washington DC are right behind. Vermont and New Hampshire have also developed robust markets. On top of the good market fundamentals (high electricity prices) & solid policy framework is the fact that this area is very heavily populated (combined more people than California) and you have the makings of a major regional market. 4. The Southeast: Mr. Honeyman only lists South Carolina as a ‘tipping point’ market in this region, but Louisiana, Georgia, Florida and North Carolina are heating up and Tennessee shows signs of life. 5. The Sleeping Giant: Not addressed is Texas, which has pockets of strong market conditions. If those dynamics can spread to the rest of the State, Texas could become a significant solar market! 6. 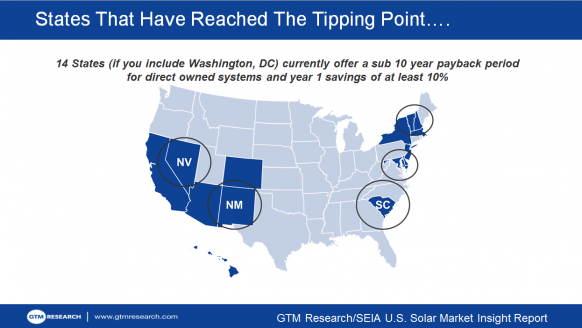 The next generation of solar states: Not to be forgotten, a series of states are showing initial signs of progress and market development: Oregon and Washington have deep green roots. The Mid West is showing signs of life with Wisconsin, Michigan, Illinois, Ohio and Iowa starting to adopt strong policies and show a number of steps in the right direction. 7. The ‘forgotten states’? Of course, there are still a handful of states (maybe down to 15 or less) that are all but stagnant. These states in some cases are strong in pursuit of other renewables (e.g. the Dakotas and Nebraska with wind), but at some point it’s likely that solar PV will take root there too. Our mission remains to unlock the consumer demand for solar. As the recent Gallup poll showed, Americans support solar more than any other form of energy.